Home » Are you wearing the BADGE for your finances? 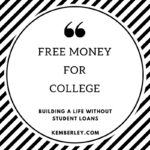 My personal finance blog, Kemberley.com, is based on five principles I believe are necessary to obtain a financial healing. These five principles have not only been a blessing to others, but have also been a blessing to myself to get my own personal finances in order. I refer to these principles as the B-A-D-G-E! A badge is defined as a means of identification. As you travel your financial journey and have to make difficult financial decisions, you have to be certain you are wearing the BADGE of God! So, let us look at what the B-A-D-G-E stands for! In order to get the most out of your finances, you have to create and stick to a budget. And not just every now and then, you must budget consistently. Budgeting provides an understanding the purpose of every dollar that comes into your possession! Not only does budgeting give you an understanding of how to use your money, but it also provides a blueprint of what you can or cannot afford. For which of you, intending to build a tower, does not sit down first and count the cost, whether he has enough to finish it—lest, after he has laid the foundation, and is not able to finish, all who see it begin to mock him, saying, ‘This man began to build and was not able to finish’? This scripture tells us the importance of budgeting. Without a plan, we may only lead to a life of financial lack. Everyone has the ability to earn money, but increasing your wealth is true financial freedom. Wealth, which is defined as your assets minus your liabilities, thus the more assets the better! Building wealth is the gateway to opportunities. Wealth allows for creating entrepreneurship, funding your children’s education, purchasing a home and leaving an inheritance for your children’s children! Debt is the enemy of financial freedom. Having too much debt or using debt unwisely can cost more than you bargained for. There is some debt you should simply stay away from. Using debt can either enhance your financial life or destroy it. Be mindful of every loan, credit card, or mortgage you obtain. Determine whether the debt will move you closer to your financial healing or further away. If you don’t know where you are going you won’t know how to get there. Many people do not use a holistic approach when it comes to finances as a result they have investments or assets that do not align with their goals. Each and every dollar has a purpose! Know both your short term and long-term goals and identify how you will get there. Simply put, create a plan for your money! You can’t expect a blessing from God without living by His principles. His key financial principle is tithing. The great thing about tithing is He promises He will open the windows of heavens and your fruit will be fruitful. But first, you have to trust Him. So what Badge are you wearing? Will you wear God’s badge and be identified as a person of God? Or will the world not recognize your financial stewardship because of the financial mistakes you are making. Kemberley Washington is a CPA and professor. Visit her blog at Kemberley.com. Follow her on FaceBook or connect with her Twitter. Like, Love, Tweet or Share this post! Thanks for sharing. The acronym was definitely beneficial to convey the message. I am hearing loud and clear! Plus I can finally say I am conscious of my BADGE and I am shining it so I may wear it proudly. Thank you so much for adding this! Let me know how I can be of any help. Could you email me your financial healing prayer to [email protected]? Thank you so much! Here is the link! Thank you so much!